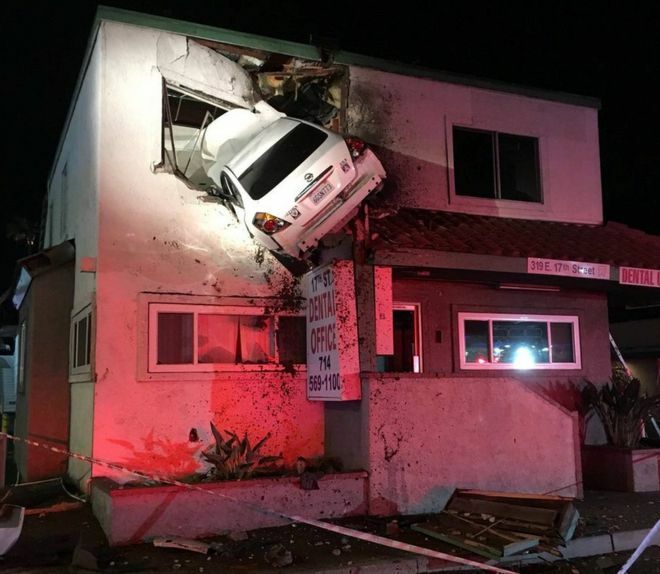 A speeding car in California was hurled into the upper floor of an office building after it hit a road divider, reports say. The crash, which left one half of the vehicle hanging out of the building, occurred early on Sunday morning. Both people in the car survived the crash but suffered minor injuries, according to police. Police told US media outlets that the driver had allegedly used drugs and was in hospital for observation. One of the two people was able to get out of the car but the other was stuck inside for more than an hour until rescuers arrived. The crash also set off a small fire which was put out by fire officials, who tweeted photos and updates through the day. OCFA in Santa Ana of a vehicle that crashed into the building. The fire was quickly extinguished, both victims are out of the vehicle safely with minor injuries. Members from OCFA & LA COUNTY Urban Search & Rescue teams are removing the vehicle from the building. The accident happened in Santa Ana, a city 35 miles (56km) south of Los Angeles. I just caught the videos of this event this morning. Man, talk about winning the lottery. WILD! They landed on top of a dental clinic. Wonder if the occupants suffered tooth damage.